Let's say I'm going in and out of a noisy environment. What's the trick to enabling vibration/turning up the ringtone volumes quickly without having to dig through settings and adjusting it for each app I need to adjust? Which device are you asking about? Most of the newer iPhones have a switch above the volume buttons that you can toggle vibrate on or off. The toggle switch just sets the ringer to silent. That’s exactly how that’s supposed to work. You’ll want to make sure that you have vibrate turned on in Settings > Sounds & Haptics. The way mine is set in the attached image will cause my phone to vibrate regardless of whether or not it’s on silent. The toggle switch simply turns audible alerts on and off. I only want the vibration in certain situations, not all the time. If I'm in my office, I want all my notification alerts, ringtone, etc... on low, but audible. Wen I move to a noisy environment where I may be unable to hear the ringtones, I want to boost the volume of the ringtones and enable vibrations. You're saying there's no simple way to switch to a "loud" profile? Nope, there are no profiles for this in iOS. 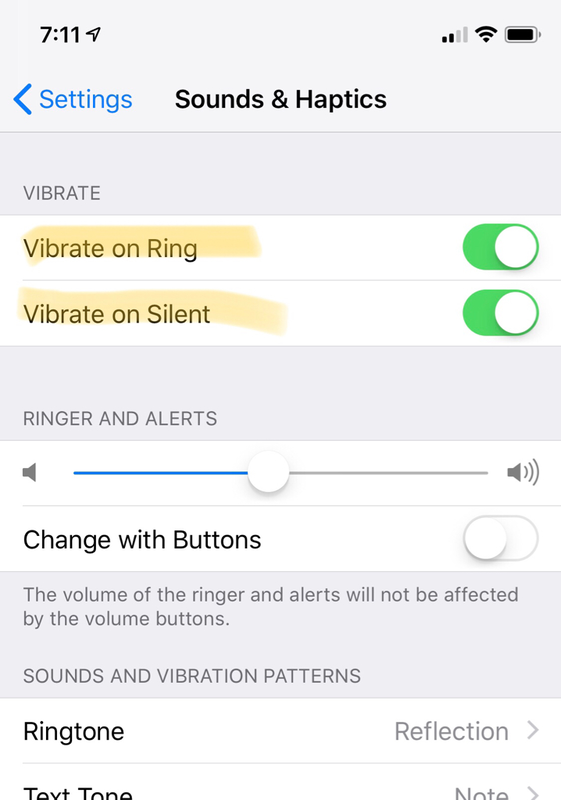 You only have the option to enable/disable the vibration for Ring and Silent. Yeah, your avatar suggests as much. I get that coming from android, iOS will feel less. But the more you use it, the more you’ll start to appreciate it. I’m one of those blessed people that never have used Android. Thank the lord, for that. kataran and Sherry_B like this. Oh no, I’m not coming from Android either which makes the lack of features in such an advanced platform even more shocking. I do hear you. But Apple in general and iOS specifically has never been about customization. I know all about the eventual benefits of having profiles as even my Nokias had it some 18 years ago. And even then I almost only went from ‘sound + vibrate’ to ‘no sound + vibrate’. The other 3 profiles I hardly ever used. If this was truly something that people wanted and kept making fuzz about, Apple would have added it by now. If you really feel strongly about this, I encourage you to send feedback to Apple. It's not even customization, it's a convenience feature. Unfortunately when relying on customer feedback, only a very small percentage of total users are going to take the time to contemplate how new features would be beneficial to them and then take the time to compose that into something that makes technical sense and submit it through a feedback form on Apple's website. Sometimes people need to be given a feature in order for them to realize how it can be of benefit to them. There's no quick way to do this just by itself on the phone. Purchase an Apple watch and set them separately from the phone. IE; set them to vibrate on your watch regardless of whether or not you put your phone on Mute mode via the side switch. This is how mine is set. Agreed. But sometimes a feature should be taken away for people to realize they never needed it as much. It's frustrating having to dig through settings to turn vibration on and off when I want it/don't want it. Being able to cycle through the profiles with the tap of a button in Control Center would be so much more convenient. Spend more money at the Apple store to make up for the shortfalls of a $1,200 phone? Hmmm. The phone is working as intended. If you want to suggest changes you are more than welcome to tell Apple about them. That's fine if you don't like the options, but there's absolutely no reason to be rude about it.